ProFirstAid is part of ProTrainings, a global network for online health and safety certification and learning. With video-based and hands-on courses in CPR & first aid, ergonomics, bloodborne pathogens, and more, you're sure to find what you need. Our courses are taught to the latest ECC/ILCOR, AHA, and OSHA standards. Upon completion, you will be awarded a ProTrainings CEU certificate displaying the course information and the number of contact hours earned. 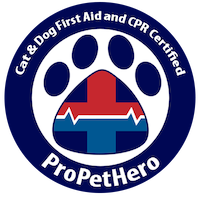 These hours are applicable to the organizations listed as well as unlisted organizations that accept pet first aid for continuing education or CEU credit. 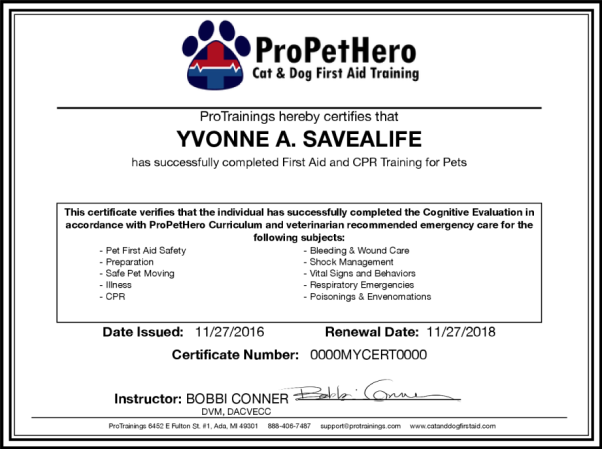 Professions that commonly accept pet first aid courses for CEU include cat and dog trainers, dog walkers, pet sitters, groomers, and more. The International Association of Animal Behavior Consultants (IAABC) is a professional organization whose mission is to support its members in promoting Least Intrusive Minimally Aversive (LIMA) principles in their work with companion animals and to be a resource for the public. They strive to assist companion animals and their humans by interrupting and preventing the cycle of inappropriate punishment, rejection, and euthanasia of animals due to behavior problems. The IAABC promotes professionalism and continuing education in the field of animal behavior consulting. The National Association of Dog Obedience Instructors (NADOI) was founded in 1965 when a small group of highly experienced dog trainers gathered and resolved to promote modern, humane training methods as well as elevate the standards of the dog obedience instructing profession. 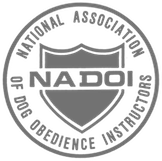 The mission of the NADOI is "to certify dog obedience instructors of the highest caliber, to provide continuing education and learning resources to those instructors, and to continue to promote humane, effective training methods and competent instruction." ​The Certification Council for Professional Dog Trainers (CCPDT) serves to establish and maintain recognized standards of competence for animal training and behavior professionals through criteria based on experience, standardized testing, skills and continuing education, and identifies those individuals to the public. Founded in 1994, Pet Sitters International (PSI) is the world’s leading educational association for professional pet sitters. PSI’s Certification Program is the most comprehensive educational curriculum available in the professional pet-sitting industry and equips students with the foundation necessary to build and grow their pet-sitting companies. Pet sitters who successfully complete the program obtain the prestigious Certified Professional Pet Sitter (CPPS) designation. The Animal Behavior College's Dog Trainer Program has certified more than 12,000 dog trainers (ABCDT) across North America since 1998. The dog training certification program includes both real world training as well as an online dog training. ABC's goal is "to offer a positive and effective training program that produces highly motivated and qualified ABC Certified Dog Trainers." CEU's are available for their Animal Behavior College Dog Trainer – Level 2 (ABCDT-L2) Certification.